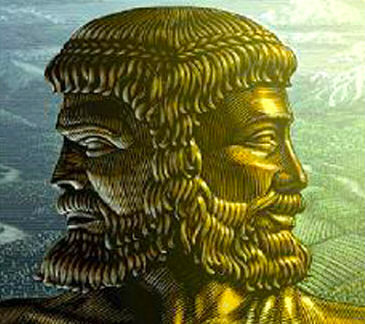 The Romans worshipped Janus who is often depicted as a man looking back and forward, the god of ports, gateways (hence janitor), transition from state to another, from old to new. The month named after him became the first month of the Roman calendar instead of the original March. Accordingly, today the world has entered first of January, 2012 Anno Domino. English word calendar is a loan word from the originally Greek καλέω for announcing the new moon. This gives the Latin kalends for the first day of the month, nonae for the middle moon and ides the full moon (Roman calendar). And God said, "Let there be lights in the firmament of the heaven to divide the day from the night; and let them be for signs and for seasons, and for days and years; and let them be for lights in the firmament of the heaven to give light upon the earth"; and it was so. And God made two great lights: the greater light to rule the day, and the lesser light to rule the night. He made the stars also. And God set them in the firmament of the heaven to give light upon the earth, and to rule over the day and over the night, and to divide the light from the darkness. And God saw that it was good. There is an excellent detailed article in wikipedia on describing the history, theology and cult of Janus. This article is very interesting but also quite filled with facts difficult to understand by us laymen who are not so deeply versed in Latin literature and classical Roman, Greek and Etruscan religions. It is highly recommended reading as an academic introduction to the study of Janus. Modern Western people have been freed by the Bible from the polytheistic world of classical Graeco-Roman period. Genesis is a veritable slaughterhouse of pagan gods leaving only one true God, the God of Israel. The fundamental change in world view, the introduction of Biblical monotheism - a view often shared also by atheists who actively deny His existence - has enstranged us from polytheism. It is not so easy for us to try to understand what Janus and other polytheistic divinities really ment for the ancients. We may try to understand and decide to call Janus a "personification" of the abstract concept of beginning, which includes transition from one state to another including from one place to another, like doorways and harbours. It is true that divinities are described in Greaco-Roman literature, art, history and theology in anthropomorphic terms. Janus himself, the first of everything, even of gods, is depicted as a man with two faces. But ancient Egyptians depicted many divinities as animals and combinations of animals and humans, warning us not to rush too fast to conclusions about "spiritual personifications". We have living polytheism that in some ways still represents the Indo-Aryan religions of the past influencing also the Semitic Near East. Hindus can teach us something about this type of religion common in areas where the Biblical monotheism has not penetrated. But this is a quite demanding way to approach the subject with many similarities but also many differences between modern Hindu and ancient Greek, Roman or Egyptian religions. 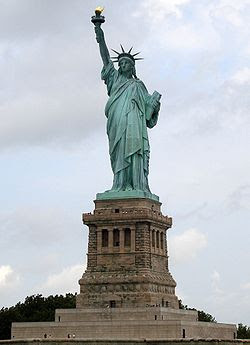 The statue, a gift to the United States from the people of France, is of a robed female figure representing Libertas, the Roman goddess of freedom, who bears a torch and a tabula ansata (a tablet evoking the law) upon which is inscribed the date of the American Declaration of Independence, July 4, 1776. A broken chain lies at her feet. The statue has become an icon of freedom and of the United States. Janus was originally the god of a society on the costs of Italy relying on seafaring for living "amphibious", of ports and transit. So he is a good symbol for the Ellis Island too, which has been for so many the gateway the the New World of America. Ellis Island in New York Harbor was the gateway for millions of immigrants to the United States. It was the nation's busiest immigrant inspection station from 1892 until 1954. The island was greatly expanded with landfill between 1892 and 1934. Before that, the much smaller original island was the site of Fort Gibson and later a naval magazine. The island was made part of the Statue of Liberty National Monument in 1965, and has hosted a museum of immigration since 1990. A 1998 United States Supreme Court decision found most of the island to be part of New Jersey. IMHO the Statue of Liberty in New York can help us to grasp in some way what a polytheist may have experienced when looking at the many statues in the temples in Greek or Roman cities. Some people remember their grandparents arrival to Ellis island when the venerable statue came to the horizon in the midst of morning clouds. Some people look at the statue and remember modern "legends" such as the X-men movie and the United Nations gathering in the presence of this statue. Some people joined President Ronald Reagan and his wife Nancy to the almost religious celebration of liberty at the foot of this statue. Yet, the sincere looking lady is not really a "personification of the idea of human liberty" even it is a powerful symbol of it. It is not really a subject for personal prayer even due respect is given to what it symbolises. It is not really a living god active in bringing liberty to the inhabitants of North America. It is just a dead statue made of metal. Mighty peace of art, mighty symbol of human aspirations that goes beyond the borders United States of America. A cold peace of metal put together by the gifted artist Frédéric Bartholdi to represent the powerful ideas of liberty that changed the world in the French revolution. shouted the founding fathers at the British while writing the Declaration of Independence with the newly found ideas of liberty in their hearts and the Statue of Liberty echoes their mighty voice.